Thais continue FIM UAM Championship dominance at Manila’s Fast Track Circuit. On Sunday 22nd July, Extreme Worx fielded the first International event at their recently constructed venue at Taguig, close by the Makati Business district of Manila. 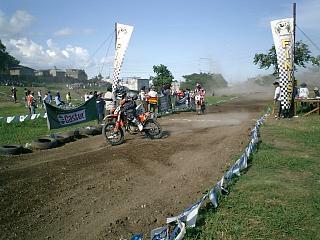 The site comprised quite good facilities with dining, change rooms and other creature comforts, however although the 1 km natural undulating Motocross track was sufficient for its inaugural UAM event, actual track surface and layout will be upgraded as Extreme Worx strive to develop the venue into a Motor sport complex. 125 class. Philippine Champ Glen Aguilar 1:08.70, followed by Indonesian Dede Mulyadi 1:09.36, and rounding out top 3 qualifiers was Thai and current Asian Champ Arnon Theplib 1:09.86 who rode with no rear brake after a plastic melt down. At 1100AM on a clear and hot Sunday, ten 85cc Riders lined up for their first Moto, including Patrick Orbe nursing an elbow injury from qualifying and Pinpon’s Honda nursing a broken cylinder suffered during morning warm up when some close riding resulted in a fluke hit on the front pipe which broke a piece out of the locating flange. After the mandatory sighting lap brilliantly handled by CoC Arthur Valdez, the field was away for their first 10min+2lap stint. Lap one positions were Arongkot, Kacey Callaway (Dubai/USA) Jenson Manuel (Philippines) Farhan and Bobby. Lap two positions – Arongkot, Bobby, Farhan, Jenson, Kacey remained constant for the remainder of the 10-lap race however the pace of those front-runners was awesome with Arongkot and Bobby lapping back markers on the 4th lap. By lap 5 the Thai held an 11 sec lead over the Indonesian and increased it to 13sec by the 7th lap before taking a well-earned chequered flag 3 laps later. The gate dropped at 1130 for Moto1 of the 125 class with 15 Riders from 7 different Countries all with the same intention of being first into turn 1, but it was crowd favourite Glen Aguilar who led the field after lap 1 followed by Dede Mulyadi, Jovie Saulog (Philippines) Arnon Theplib, Khaliumbold Erdenbileg (Mongolia). These 250fs were raising dust but not enough to cause concern to Riders or Officials as the leaders encountered lapped Riders by the 4th lap. Glen held his lead until the 5th lap when he fell, a victim of the slippery surface, which relegated him to 10th position. Dede maintained 2nd place for the entire 20min+2lap Moto but was now trailing a new leader as the smooth as silk Thai moved into the front spot. This was quality racing at its best with veteran Jovie Saulog holding off young gun Filipino Kenneth San Andres for 5 laps before youth overcame age on the 11th lap and also enabled Khaliumbold to move into 4th place before Jovie recovered and repassed on the 16th lap. Meantime Glen had fallen again, this time taking considerable time to restart. 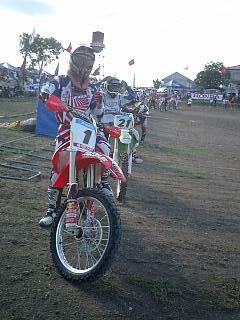 Arnon “Turbo” Theplib cruised to a well-deserved win on the 19th lap followed by Dede, Kenneth, Jovie and Khaliumbold. 1440, Moto 2 for the young guns and this time it was Jenson Manuel –KTM who led the field at lap 1 before Arongkot Pinpon-Honda moved to his customary front place, but all eyes were on 2nd Jenson, 3rd Farhan-Kawasaki & 4th Bobby-Honda as they were locked together for lap after lap, wheel to wheel for six laps before Farhan passed Jenson and then within sight of the finish line Farhan fell in questionable circumstances and final placings were 1st Arongkot, 2nd Bobby, 3rd Jenson, 4th Farhan, 5th Kacey-KTM. Thai ingenuity from Pinpon’s mechanics had succeeded and the smiling 12yo showed no mercy to his Honda held together with a mixture of 2 pack, wire and spring. from left – Bobby Pamungkas. Arongkot Pinpon. Jenson Manuel. 1600, 125 Moto 2. Another holeshot for local favourite Glen Aguilar-KTM followed by Turbo-Honda, Jovie Saulog-Honda, Japanese Takeshi Tabuchi-Yamaha and Khaliumbold-Honda. 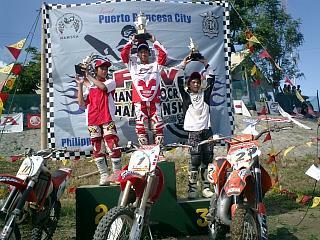 Short lived though as heir apparent to Philippine Riders -Kenneth San Andres-Kawasaki stormed through to 3rd place on the third lap. Once again the leaders were encountering lapped Riders by the 5th lap while Dede Mulyadi-Kawasaki had to constantly pass Riders to move up from his early 7th place while Khaliumbold was forced to retire with a flat front tyre which put paid to the aggressive Mongolian effort on the 9th lap. This time Glen did not fall, but no one was going to pass the Thai on the day and final placings were 1st Turbo, 2nd Glen, 3rd Kenneth, 4th Dede, 5th Takeshi, and mention must be made of a creditable 6th place to Indian Rider Karan Kadam-KTM. Glen leads Turbo – but not for long! 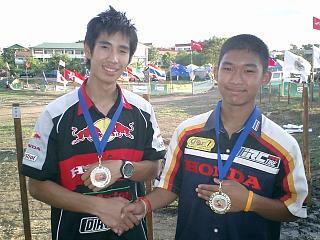 To wind up 2006, engraved Asian Rider medallions were presented to 125 winner - Arnon Theplib and 85cc winner Arungkrung Pinpon and it was announced that Turbo’s prestigious award of an entry to World Championship MX would take place at the England Round.